Friday marked the close of another interesting week for precious metals, one of the hottest investment sectors. Before the holidays began, a Christmas rally rocketed the gold and silver bull market to multi-decade highs. Gold reached $540 and silver $9.20+. Yet the holiday cheer in precious metals was dulled by a market pause. Gold pulled back to the $500 level and silver fell to $8.50 just as Christmas approached. Since the market correction, several jolly elves were seen buying gold and silver which helped firm the market this week. They filled their pockets with gold and silver at discounted prices, making their cheeks extra rosy this year. Gold closed at $515, up about $15 and silver at $8.80 a gain of around $.30, for the week. In last weeks FSN, Weekly Radio Broadcast, financial analyst heavyweight, Jim Puplava, announced his firm contention that the precious metals market has recently entered the second wave up in a new bull market. Jim Puplava was a t.v. financial news anchor in the San Diego area and has been remarkably prescient in his market forecasts over the past several years: "gold should reach $1,000 and silver $50 in this second phase of the bull market in precious metals." Similarly, market analyst, Marc Faber believes that gold will skyrocket to incredible heights, as reported this week in Barron's: "Hong Kong based fund manager Marc Faber believes that gold will reach $3,000 per ounce due to the US Government eventually defaulting on its debt." Ned Schmidt of, The Value View Gold Report, concurs and insists that gold remains a very strong buy. His newsletter has been predicting $1,300 gold for some time and continues to hold to that price target: "Gold is regaining a leading role as a monetary store of faith as the Federal Reserve has demonstrated both an unwillingness and an inability to properly manage the U.S. economy. The world is shifting from the fiction of paper money to the reality of Gold. Government money is in general being divested. Given the U.S. Mortgage Debt Bubble and the Global Liquidity Bubble, $1300 Gold and a $3 Euro are likely. Schmidt goes on to say: "If the average ratio and today's value for the S&P 500 are used, $Gold should be at $1,533, or 204% above the current level." "The gold price having moved over $529, regardless of the retreat, means to me that the next visitation will be at $750... Spectacular is defined at $750, sooner than even I suspected it might happen." Mr. Sinclair backs up his convictions. He offered a guarantee to his readers who bought gold coins when gold was trading near $400 per ounce. Sinclair personally backed any losses that they might incur. Needless to say all of his readers who followed his advice have profits of more than 25% in less than one year. In the short to medium time frame, my technical gut instinct is telling me that we still need to blow off some steam in the gold and silver markets. The near parabolic rise in precious metals should have further to correct, given the recent surge higher. Gold may decline to as low as $450-$475 and still remain in a bull market. Silver could slide to the high $7 area. Once the markets find support and consolidate for a few weeks-months, the advance should resume. This is particularly true in the silver market. Silver had clearly been in a choppy market for almost two years. Gold on the other hand moved far above its consolidation level and may require a consolidation before new high prices are recorded. On the long-term time horizon, the price forecasts of top analysts listed above: $750, $1,000, $1,300 and $3,000, seem more and more plausible. 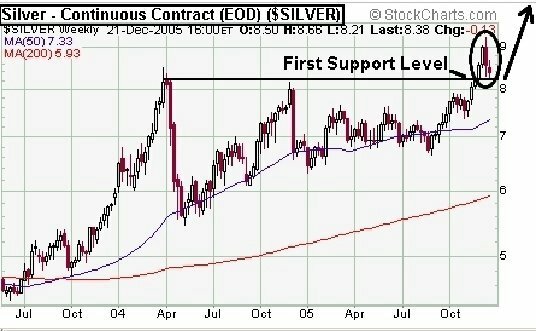 The recent break-out in silver should lead to at least $10-$11 in the new year. 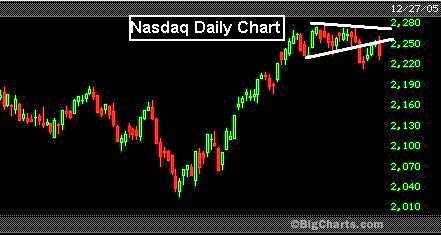 2006 should bring another exciting chapter in what is shaping up to be the greatest bull market in history. Thanks for reading. Please visit my blog and web site for free daily market articles and analysis. Click Here. 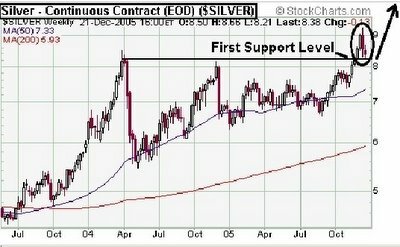 Silver And Gold Stocks To Outperform... - Maund. 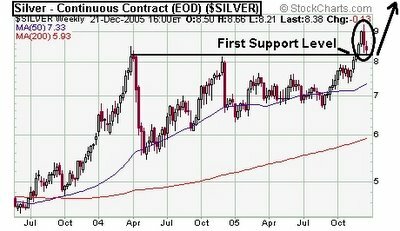 Gold and silver ended up making handsome gains during 2005, and the good news is that 2006 promises to be better still. Both took off during the last four months of the year, to such an extent that a reaction set in towards mid-December, which has partially alleviated the short to medium-term overbought condition that had developed, although in a powerful bull market it should be noted that prices can run an overbought condition for a considerable time. Our 5-year gold chart shows the entire bull market to date, and on this chart the 200-day moving average can be seen to have been rising steadily, indicating that, whatever intermediate reactions have occurred along the way, gold's long-term uptrend has been relentless. The situation for silver has been rather different as we can see on its 5-year chart. 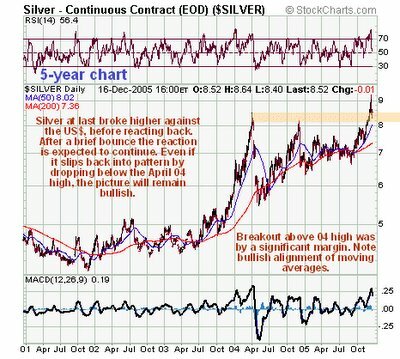 After a spectacular ramp in late 2003 and the first few months of 2004 resulted in an extremely overbought condition, silver stopped for a major breather, which continued until late August of this year, after which the advance resumed, with breakouts in various other currencies eventually being followed by a breakout above its April 04 US$ high, which only happened this month. Gold and silver certainly look impressive on US$ charts, but it is when they are charted against a wide range of other important currencies that the potency of this bull market is unequivocally revealed. Even gold's most vehement detractors have no choice, when confronted with these charts, but to grudgingly acknowledge that the precious metals are in a powerful bull market. The 5-year chart for gold in Euros reveals the roaring bull market that followed a successful breakout above the resistance in the Euro 3.50 area that has capped the price for several years. It is a similar story with the Swiss Franc, where gold took off once it broke above the strong resistance towards SF 5.50, and is now in a powerful uptrend. The strong advance in gold and silver came to an abrupt halt a couple of weeks ago, and was followed by a sharp reaction. This reversal occurred at a point where the metals had become extremely overbought, as signalled by short-term oscillators and their yawning gaps with their moving averages, and featured a "Reversal Day" in gold, during which it staged a "throwover" breakout above its upper channel line on its long-term chart, before closing at the low for the day - a clear warning that the rapid intermediate uptrend had exhausted itself, at least temporarily. The subsequent reaction, in both gold and silver, has halted - for now, at least - just above the 50-day moving average against many currencies. Having made it absolutely clear even to the most stubborn skeptic that the precious metals are in a powerful bull market, we will now turn our attention to the outlook. There is an old and true expression in the market "Let the trend be your friend" and that is exactly what investors should do with regard to gold and silver and precious metals stocks. 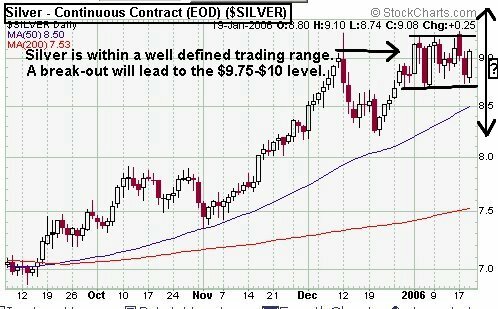 Looking again at the silver chart, the new uptrend looks to be still in its early stages - it is only in December that silver overcame the strong resistance in the $8 - $8.40 area towards its earlier highs. This is believed to be a development of great significance as the price has finally broken out from the giant trading range that developed following the May 04 high, although this move was presaged by breakouts by silver in other currencies, so that it became a matter of "if", not "when" it would break out against the US dollar. Here it should be noted that the bullish outlook will not be impaired by a reaction back below $8.40, although this is not considered likely. This positive outlook for silver implies that the recent accelerated rate of advance in gold is set to continue, even if the Reversal Day in gold a couple of weeks ago leads to further short to medium-term reaction. On the gold chart we can see that, despite the reaction of the past couple of weeks following the Reversal Day, gold is still towards the upper return line of its long-term uptrend channel, and with the 50-day moving average having opened up a fairly large gap with the 200-day, there is clearly room for further consolidation/reaction before further progress is made. The most positive scenario is an accelerating advance leading to a genuine breakout above the top line of the channel - this would lead to a spectacular advance, while the most conservative scenario would involve an intermediate reaction right back to the lower channel line before the long-term uptrend re-asserts itself. But an interesting point that should be made here is that the action in stocks is suggesting that they are not going to react by much if the metals continue to correct in the short to mdium-term. Now we will look at one of the most interesting charts of all, which is a 5-year chart of the HUI GoldBUGS index divided by the price of gold, or put more simply, STOCKS versus GOLD. Many precious metals stocks investors are painfully aware of the rotten relative performance of stocks compared to gold over the past couple of years, and don't need to see this chart to be reminded of this state of affairs. This is especially true of many US traded stocks such as Bema Gold, Golden Star and Miramar Mining, which have performed miserably. However, as some readers will have already observed, despite gold and silver reacting sharply towards mid-December, stocks hardly reacted at all, and now, as the metals have bounced back, stocks are romping ahead, with the HUI index moving ahead strongly to clear new highs, and finally breaking out of the big two-year trading range that it had been stuck in. This is the first time we have seen this kind of action in a very long time. Looking at the 5-year STOCKS versus GOLD chart we can clearly see that stocks have just broken out of a 2-year downtrend against gold. We therefore appear to be entering a period in which stocks are set to outperform gold, and given the positive outlook for gold, this means that stocks are set to perform very well indeed. This certainly fits with the charts of many gold and silver stocks - large, medium and small, which are looking very bullish. What all this means is that if you are not already positioned to take advantage of the large gains pending in this sector, you should get on with it and decide what to buy and buy it. As already pointed out above, a short to medium-term reaction in the metals is unlikely to put much of a dent in the prices of stocks, so downside is viewed as relatively limited. Alright, now we will examine the issue of what to go for - large cap, mid cap, or small cap and exploration stocks. The good news here is that the short answer is "all of them", although this needs some qualification. Regarding the large-cap issues, the ones to go for are those that are showing good relative strength, such as Gold Fields (GFI), which was recommended on my website; www.clivemaund.com before it broke above key resistance at $15, our old favourite Glamis Gold (GLG), and, of course, Goldcorp (GG). Don't be put off by the fact that many of them look overbought right now, the upside is still BIG. A key advantage of these large cap issues is that many of them pay big fat dividends, which are very nice on top of large gains in the stock price. Another group that is worth going for is the mid-caps. The US traded mid-caps such as Bema Gold (BGO), Golden Star (GSS) and Miramar Mining (MNG) were singled out for a terrible beating as the sector consolidated over the past couple of years, and yet, if we look at their long-term charts, they don't look at all bad, and given the pummelling they have taken, they are still at good prices, with plenty of upside. Amongst this group, Golden Star in particular looks most promising. Finally, there are the small cap and exploration issues, which many investors are understandably very leery of after so many of them got ground into the dust over the past two years. However, the time to go for stocks like these is when nobody else wants them, but there is evidence, as now, that a new uptrend is beginning. Two key points need to made regarding this category of stocks. One is that, due to their risk factor and more unpredictable behaviour, they should form a relatively limited part of a portfolio for the average investor - for experienced speculative investors it is another matter. The other is that it is very important to be selective with these stocks. Many end up going nowhere and sometimes very promising chart patterns in these stocks turn sour, often due to skullduggery on the part of management. Over the past two years the writer has witnessed one of these stocks go bad, despite a very promising chart pattern, due to the management diluting stock in a "boiler room" type operation where they were printing additional stock like Greenie prints dollars. Another one kicked its investors in the teeth by hiving off its silver holdings into another company, thus erasing the principal reason for owning the stock. Still another "glossy brochured" its holdings, and took investors on sanitised guided tours of its mine, carefully obscuring reality from investors, but when the truth leaked out the stock tanked. You get the picture. Management incompetence in some small-cap mining and exploration stocks is legendary, and it is true to say that managers of some small mining stocks couldn't return with a profit from a day on a lemonade stand. However, this is not to detract from the many small companies which are well run. In considering the weighting of small-cap and exploration stocks in a portfolio, it is worth bearing in mind that this category of stocks tend to lag in a bull market uptrend - the large-cap issues tend to lead, which is what we are seeing now, then the baton is passed to the mid-cap issues, finally, as the uptrend enters its latter stages, the small-caps perform best, and because of their leverage and, frequently, shortage of stock, they can make amazing gains in a short period. Examples of small-cap issues that look very good are Excellon Resources (EXN.V), a small silver that has been recommended all year on www.clivemaund.com, and was last recommended at C$0.19 before it started to break higher, Pinnacle Mines (PNL.V), which is just breaking out of a massive base, and Great Panther Resources (GPR.V), which has plenty more upside despite its sizeable gains in December. Clive Maund is an English technical analyst, holding a diploma from the Society of Technical Analysts, Cambridge, England. He now lives in Chile. Visit his subscription website at clivemaund.com. [You can subscribe here]. No responsibility can be accepted for losses that may result as a consequence of trading on the basis of this analysis. Copyright © 2003-2005 CliveMaund. All Rights Reserved. Gold To $1,300 - Schmidt. Moneyization: The global financial phenomenon of individuals and businesses moving their funds to monies in which they have the highest confidence, or money in which they have a higher store of faith. One can not help be regularly disappointed with the popular media. The business media, however, should be a step above the norm, as they should largely be reporting facts. Unfortunately, journalists feel compelled to filter the news through the sieves they consider brains. Business Week has historically been above average, but even they often cross the line from journalistic reporting to immature financial forecasting. Recently the SPECIAL DOUBLE ISSUE of Business Week arrived in the mail. Headline: Where to invest in 2006. Really exciting stuff was the implication. Like the occasional recipe, it turned out a dud. There you have it folks, the research is done and you can sell your positions. A journalist, acting in the role of amateur investment analyst, has decided your Gold investments are futile. Bear in mind also that a few issues before this same publisher of journalistic business research recounted the glories of Google. Well one of them, Google or Gold, is going to fall below $300. In fact, one of them is going to fall by $300. And Gold is not the likely candidate! Journalists and many investment professionals do not understand that the critical issue in this era is not growth versus value, inflation, or Google. Gold's price rising to cycle highs in so many national monies is the manifestation of the moneyization process. Investors around the world are moving to the money, Gold, in which they have the highest faith. The value of national monies is the issue of this era. Gold's price rise indicates investors around the world are turning away from existing artificial national monies. The issue for the U.S. is not the growth rate of GDP, but rather whether or not a set of economic conditions have been put in place that will ultimately result in the global repudiation of the U.S. dollar as a reserve currency. On the more immediate horizon is the Euro, unhampered by an unmanageable current account deficit, which will rise in value relative to the U.S. dollar far higher than any expect. Further out will rise the Chinese renminbi, carried higher by real economic progress. The issue for the U.S. is the secular decline in the importance of the dollar. Gold is regaining a leading role as a monetary store of faith as the Federal Reserve has demonstrated both an unwillingness and an inability to properly manage the U.S. economy. The world is shifting from the fiction of paper money to the reality of Gold. Government money is in general being divested. Given the U.S. Mortgage Debt Bubble and the Global Liquidity Bubble, $1300 Gold and a $3 Euro are likely. The CNBC daily reports will be simple, "The U.S. dollar bought even less today than it did yesterday. Canadian dollar did not trade today on foreign exchange markets." $Gold trading at cycle highs carries a far greater message than many commentators realize. The dollar price of Gold gives us the Gold price of a dollar, and likewise for any other national money. Simply take one(1) and divide by the dollar price of Gold. That calculation, the price of the dollar in terms of Gold, for the past 24+ years is plotted in the First Graph. The U.S. dollar is trading at a 24+ year low. That is reality, not conjecture. All the discussion of illusionary productivity gains, the internet wonder, Miscrosoft, Google, or any of the other fantasies of the Street does not erase the fact that the U.S. dollar has now traded at the lowest level in more than two decades. That is moneyization. The world is moving out of dollars. Gold trading at a cycle high is an indication of the global nature of the move out of government monies and into real money. What this Business Week writer and so many other misguided individuals in the popular business media are missing are the developments shown by the relationship plotted in the First and Second Graphs. In the Second Graph is plotted the ratio of $Gold to the S&P 500 at year end. While 2005 is not yet in the history book, relative values are likely to change little in the next few days. As many of us know, this ratio turned up in 2000 and gave a major long-term buy signal in 2001. A rising ratio means $Gold is performing better than paper equities. Similar set of events occurred in the 1970's, signaling the beginning of the last bull market cycle in Gold. One would think that a picture is something a journalist could understand, but they have to make an effort to find the picture or talk to someone other than the "paper peddlers" on Wall Street and at mutual funds. This analysis provides the basis for two important activities, value estimates and trend confirmation. If we use the average value of the ratio plotted in the Second Graph, estimated values for $Gold and the S&P 500 can be created. If the average ratio and today's value for the S&P 500 are used, $Gold should be at US$1,533, or 204% above the current level. If today's value for $Gold is used, the S&P 500 should be at 417, down 67% from the current level. Reality will be somewhere in between. However the message is clear, buy $Gold and sell U.S. paper stocks. The Third Graph portrays only the most recent experience. The circles are the ratios plotted in the previous graph. Note the long-term buy signal that was given when the ratio rose above the moving average at the end of 2001, when $Gold was less than $300. Second, the ratio has risen to a new cycle high. This action is a technical signal that confirms the uptrend. When the price of an asset, $Gold in this case, moves to an absolute high we want the relative measure to confirm that move. The ratio of $Gold to the S&P 500 is confirming the uptrend in $Gold's absolute price. Third, the ratio rising in 2005 means that Gold has again outperformed paper assets. $Gold investors, capitalizing on these trends, have an important ally in their pursuit of profits. The Federal Reserve, by mismanaging monetary policy for nearly two decades, has created $500 Gold. Fortunately for $Gold investors, President Bush is making an equally inept appointment, Ben Bernanke, to serve as the next Chairman of the Federal Reserve System. Dollar denominated investors that have moved to Gold and those foreign investors that have shifted assets out of dollar investments will be well served by the new chairman. Bernanke's baggage includes both his Delusion and his Illusion as well as his fear of the last Depression. The Delusion contends that the U.S. current account deficit is not the consequence of bad monetary policy. Rather, that deficit is the fault of other countries not also pursuing a consumption binge. If consumers in foreign countries would also spend more than their income as is the case in the U.S., the U.S. deficit could be filled. In short, two economic wrongs would combine to make one economic right. The Bernanke Illusion is that if monetary policy was managed based on a measure of inflation an economy in equilibrium would be the consequence. Unfortunately, the measures of inflation created by the U.S. government border on the nonsensical. No private company would be permitted to issue such misleading statistics. That aside, this concept of inflation targeting looks fine on a two dimensional classroom blackboard. The real world is not a chalkboard. Monetary policy based on this "inflation rule" is the equivalent of driving your car with a speedometer measuring in bushels rather than miles per hour. $Gold investors will be rewarded with profits by investing in real money, not by following chalk dust illusions. Monetary policy, based on the Chairman's desire to please political forces and the Street, has been generally unwise. That, however, has been how U.S. monetary policy has been determined for two decades. Continuing that approach, the Federal Reserve recently announced the intended suspension of the data release on a broad measure of the U.S. money supply, M-3. The European Central Bank(ECB) takes a different view of the matter, and recently raised rates as a consequence of money supply growth. The differences in these approaches is worth noting. The ECB thinks "printing" too much money is a policy error on the part of the central bank. Excessive money creation would likely will lead to price increases and a reduction in the purchasing power of the Euro. Then we have the Federal Reserve which does not believe that even reporting complete money supply data is a worthwhile effort. The ECB pays attention to how many Euros exist in the world. The Federal Reserve sets policy based on using interest rates, easy money, to hype one part of the economy or another. In the future, monetary policy will be based on the chalkboard theories of a new chairman. Little doubt exist that with these different approaches that the U.S. dollar is set for further depreciation. Our Fourth Graph considers the recent action in $Gold. Policy mistakes, of years past and yet to come, and a structural trade deficit mean that the long-term bear market for the U.S. dollar continues without interference. Well-positioned investors will benefit from policy ineptness at the Federal Reserve as far as one can see into the future. Investors denominated in U.S. dollars need to move in a timely fashion into Gold. Waiting till $Gold is trading well above $1,300 will be too late. As shown in the Fourth Graph, $Gold has been moving toward another important buy signal. This week's rally will likely be followed by a down leg into that signal. Dollar denominated investors need be prepared. Canadian investors have a strong imperative for investing in Gold. First, the future for the Canadian dollar is inextricably linked to the fate of the U.S. dollar. North America is a single economic boat. We are all in it together. When a boat sinks, the whole boat sinks. Second, the rally of recent years in the value of the Canadian dollar versus the U.S. dollar creates a rare opportunity for especially timely purchases of Gold. Do not let the paper money illusion keep you from making wise long-term investments. As the Fifth Graph portrays, CN$Gold may also, after this week's rally, work itself into another important buy point. Atkins, R. & Giles, C.(2005,November 29). Trichet's test: In raising rates he must weigh the risk to tentative recovery. Financial Times,p.17. Weber, J. (2005, December 26). Hedging against inflation. Business Week, p.123. WEEKLY MARKET REPORT; Sunday, December 25th, 2005. Executive Summary: Gold and silver entered a trading range and closed near the break-even point. Gold finished near: $500 while silver closed near: $8.50. The XAU remained range-bound for the third consecutive week. The dollar rallied sharply: Dollar Chart. Short Term: The $XAU was range-bound: Daily Chart. Medium Term: In the weekly chart, the $XAU inched highest: Weekly Chart. Long Term: The fundamental argument for a bull market in precious metals and the $XAU remains sound. Rising interest rates are common during gold uptrends, e.g. rates rose during the 1970's bull market. The $XAU is above the neckline of a bullish: H&S Pattern In The Monthly Chart. Gold and silver are blowing off steam after reaching a major market peak. A re-test of the highs remains possible, however, new highs are not expected at this time. Junior gold and silver stocks appear more attractive due to their lack of participation in the recent rally. 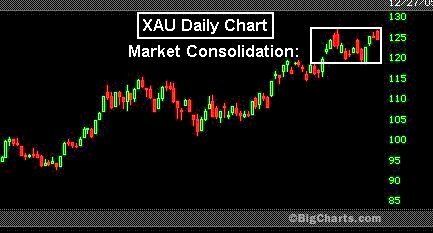 The former precious metals forecast has been fulfilled: "..expect the next few months to yield $500+ gold, silver in excess of $9 per ounce and an $XAU price of 135." Thanks for reading, Chris Waltzek. 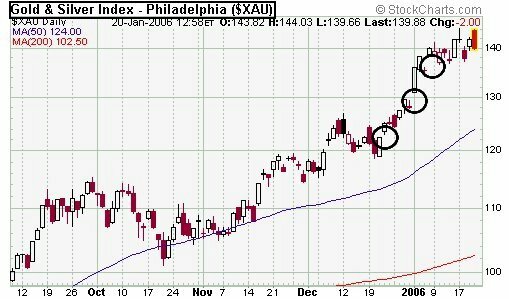 For additional gold and silver analysis: Jim Puplava, Jim Sinclair, Clive Maund and The Schultz Gold Stock Index. Executive Summary: The Dow Jones Industrials, S&P 500 and Nasdaq consolidated this week: (click to view the charts) Nasdaq, Dow Jones, S&P, Dow Transports, and Semiconductors. Market volatility remained tame: $VIX and $VXN. The price of oil continued to trade in a range, closing near: $58 per barrel. Trading Coach: Never risk more than 2% of account equity on any trade - determine position size using protective sell stops. For daily trend updates: Click Here. Robert Colby's Daily Market Update: Click Here. Silver to $15 In 2006!!! $40 In A Few More Years! This week, gold finished the week on Friday at $554, near the break-even point. Silver closed at $8.88, down about $.25. lower than the previous weeks level. Last week in the Weekly Market Update, I suggested that silver did not confirm golds new 25 year high: "Although gold hit a fresh new high, silver did not confirm the move. 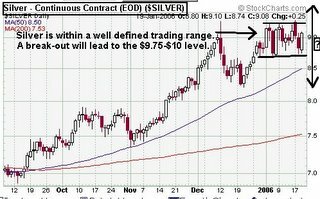 We will be watching the silver market consolidation this week for hints toward market direction." As expected, silver did not break-out. In fact it remained within the trading range. This is not necessarily a bearish development. However, until silver confirms gold's new highs, the bull will be napping. The XAU gold stocks index climbed to new highs on Tuesday, but suffered on Friday. The market is within a narrow trading range. One worrisome technical aspect are the three unfilled gaps left in the chart below. In the event that the market begins a retracement, the gaps will provide targets during the decline. The major stock market indexes were hit hard this week. The Dow closed down almost 300 points, The Nasdaq lost almost 70 and the S&P gave up 26. Last week we noted in the Weekly Update: "The markets all lost momentum this week and appear capable of a retracement this week." As of Friday evening, the major indexes appear very oversold. A short term rally should develop early next week. This week, I had the pleasure of chatting with, James Turk of GoldMoney.com, Roland Watson from Newerainvestor.com and Jim Rogers, the Adventure Capitalist, on the Gold and Silver Review broadcast. James Turk's interview is posted at the website and the other two will post later this week. James Turk shared his thoughts about the bull market in gold and silver. He is expecting much higher prices ahead for gold and substantially higher prices for silver. To listen to the broadcast in RealAudio or Mp3 formats, click here. All the way from Edinburgh, Scotland, Roland Watson shared his forecasts for gold stocks, gold and silver. Roland discussed his Elliott wave methods for deciphering market clues. 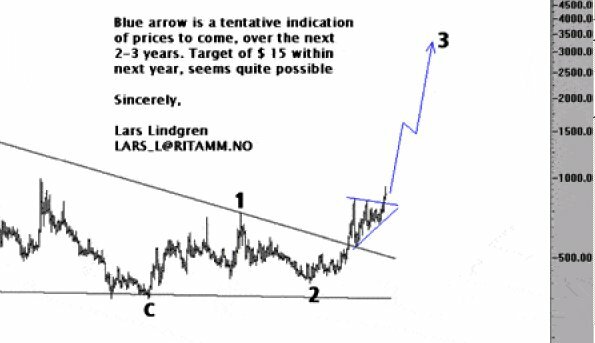 Roland expects four digit gold and much higher silver prices ahead. Roland has a newsletter that can be found at his blog. Jim Rogers told our listeners that he is long gold at this time and went into the details of the new commodities bull market. Jim believes that the commodities bull has many years to run. He talked about his latest book, Hot Commodities, a must read or visit his website here. Jim Rogers interview will air next week. Chris Noon from, Faces In The News, reported on Warren Buffett's latest warnings about the US economy. "... The Oracle of Omaha occasionally becomes the Prophet of Impending Doom, ...Don't count on a soft landing for the country's deficit-addicted economy, Buffett reiterated Tuesday. The U.S. trade deficit is a bigger threat to the domestic economy than either the federal budget deficit or consumer debt and could lead to "political turmoil", the decorated investor warned. Buffett's bearishness is understandable: Fixing the trade deficit--which soared to a record $665.9 billion in 2004, and is expected to top $700 billion this year--is becoming rather like turning around an ocean liner by dipping a teaspoon in the water." Jim Sinclair is "sticking" to his $1650 estimate for the price of gold. He writes, "Buffett is no dummy nor am I. We have pushed all this ...economics to the predicted point of no return. That point is here and now. That is why the naked shorts on two hammer plays have failed. The size of their short of gold position as a public number is a tool of their own demise..."
Lindsay Williams reported this week: "I spoke to TheBullionDesk.com about a week ago, and they say $618 is an average for the whole of 2006, with a spike up to $760." "... junior gold stocks will be the place to be invested: "Junior companies are one of the best places to put your money, but it's got high risk," ...You need a high tolerance for risk, but I think you'll have very big returns." McEwen shared his prediction for gold of the next three years: "He believes gold will reach $850 and then leap, "significantly higher" in a manic phase, similar to the dot.com bubble mania of 2000. Investment bankers are beginning to wake up to the reality that analysts like Jim Puplava and his guests have been noting for years: "Merrill Lynch of New York and Australia’s Macquarie both raised their projections 19% last week to $525 and $565 respectively; bullion bank JPMorgan is looking for an average of $558 for the year; and Swiss bank UBS recently upgraded its projection to $520." Next, Alf Field revised his short and long term gold targets to: $655 and $2,750, respectively. Lastly, Richard Daughty quotes a gold analysts predictions this week: "From the mid-1970s until the mid-1990s gold rarely went below $500 in today's dollars, so $500 gold really is historically cheap. Today gold would have to challenge $1000 before it started getting expensive and it would have to rocket up near $2200 to hit all-time real highs. "The Mogambo himself, Daughty wrote: "Now there is 4x as much fiat paper floating around relative to gold as there was in 1980! The $850 spike high in January 1980 multiplied by this ratio yields an all-time gold high of $3570 in today's dollars." Earning him our Big Shot of The Week Award. The upward trend in the gold and silver markets will remain intact as long as higher highs are followed by higher lows. Gold reached another 25 year high point this week. Silver remained within a narrow trading range for the second week, still unable to confirm new highs in the gold market. 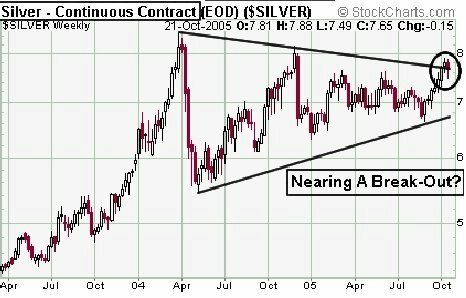 In order for the current break-out in gold to remain valid, silver should close above the current consolidation pattern as seen in the chart at the beginning of this article. $520 + $525 + $565 + $558 + $618 + $655 + $760 + $850 + $1650 + $2,750 + $3570 = $1,183. We're continuing to watch for a move out of the current silver market trading range. A close above the range should lead to higher gold prices, a close below the consolidation may lead to weakness in the short term for precious metals. Fiat Money Inflation In The U.S.
" Thus came a collapse in manufacturing and commerce, just as it had come previously in France: just as it came at various periods in Austria, Russia, America, and in all countries where men have tried to build up prosperity on irredeemable paper (worthless money.)" from: Fiat Money Inflation In France. In the late eighteenth century, the French Revolution lead to deteriorating socio-economic conditions throughout the nation. The money supply climbed to staggering levels, resulting in a financial crisis of epic proportions. In fact, excess fiat currency exacerbated tenuous living conditions, which in turn catapulted living costs to unimaginable heights. Similarly, rising energy, commodities and precious metals prices indicates the return of domestic inflation. This article compares excerpts from the classic financial text: Fiat Money Inflation In France, with the current domestic economy in order to demonstrate conclusively that gold and silver backed money remains the only suitable remedy for national inflation.
" To cure a disease temporary in its character, a corrosive poison was administered (Printing Fiat Money), which ate out the vitals of French prosperity." from: Fiat Money Inflation In France. The nation of France experienced two monetary travesties in the 18th century. The first national experiment with fiat money is remembered as, John Law's, Mississippi Scheme. John Law's infamous machinations promoted the distribution of paper money in 1719, approximately 70 years before the French Revolution. Until that point, the nation relied exclusively upon gold and silver coinage. Law's experiment with paper money mirrored the result of all fiat currencies throughout history: complete economic collapse and financial ruin.
" New issues of paper were then clamored for as more drams are demanded by a drunkard...The great majority of Frenchmen now became desperate optimists, declaring that inflation is prosperity. Throughout France there came temporary good feeling. The nation was becoming inebriated with paper money. The good feeling was that of a drunkard just after his draught; and it is to be noted as a simple historical fact, corresponding to a physiological fact, that, as draughts of paper money came faster the successive periods of good feeling grew shorter... " from: Fiat Money Inflation In France. Thus, by 1790, the ensuing monetary disaster lead to morose living conditions and social upheaval. In fact, merely five years elapsed between the onset of inflation and the inevitable economic calamity. During that brief period, many essential goods increased in price by more than one hundred fold. For instance, a bushel of flour cost approximately 40 cents in 1790. By 1795, the same quantity of flour rose by ten fold to $45. Similarly, a small cartload of lumber rocketed higher from $4 to $500, an astronomical increase in excess of 1,000%.
" Prices of the necessities of life increased: merchants were obliged to increase them, not only to cover depreciation of their merchandise, but also to cover their risk of loss from fluctuation; and, while the prices of products thus rose, wages, which had at first gone up, under the general stimulus, lagged behind. Under the universal doubt and discouragement, commerce and manufactures were checked or destroyed..." from: Fiat Money Inflation In France. Consequently, inflation statistics from the 18th century indicate difficult times ahead for the domestic economy. For instance, a typical sandwich costs $3, at present inflation levels. Yet, as inflation rates approach the hyper-inflation figure of that period, price increases by 1000%. Few domestic families could afford such prices. In fact, $20 per gallon of gasoline, $15 per loaf bread, $35 per gallon of milk and a $200 meal for a family of 5 is possible. If the previous statistics seem implausible, hyper-inflation figures from the past show that they are not only possible but relatively conservative.
" Early in the year 1789 the French nation found itself in deep financial embarrassment: there was a heavy debt and a serious deficit." from: Fiat Money Inflation In France. For decades, careless Federal Reserve monetary expansion has over-stimulated the economy. As a result, mountains of unbacked paper money, excessive debt and incalculable deficits jeopardize national solvency. Protective Federal Reserve policies secured economic growth at the expense of inflation. Records indicate that economic collapse is the inevitable result of such currency manipulations.
" La Rochefoucauld proposed to issue an address to the people showing the goodness of the currency and the absurdity of preferring coin. The address was unanimously voted. As well might they have attempted to show that a beverage made by mixing a quart of wine and two quarts of water would possess all the exhilarating quality of the original, undiluted liquid." from: Fiat Money Inflation In France. Eventually the dollar bubble will burst as excessive monetary liquidity further threatens economic solvency. In order to better illustrate the danger of unregulated liquidity one can compare the economy to an expanding rubber balloon. For instance, each time the balloon (economy) sags, more air (money creation) is introduced. The balloon remaines intact until it expands beyond the bursting point. Following decades of monetary stimulus, the economy cannot sustain its present, over-inflated state. Indeed, until 2005, monetary growth climbed sharply following the September 11th, 2001 terrorist attack, a fateful episode in American history. The Federal Reserve cushioned the economy from a stock and bond market crash and decrease the liklihood of panic by increasing liquidity. Although the short-term affect was market stabilization, the long-run result is damaging inflation and currency collapse. Thus, Irrational expansion is eroding confidence in the dollar as the global reserve currency.
" Strange as it might seem to those who have not watched the same causes at work at a previous period in France and at various times in other countries, while every issue of paper money really made matters worse, a superstition gained ground among the people at large that, if only paper money were issued and were more cunningly handled the poor would be made rich. Henceforth, all opposition was futile." from: Fiat Money Inflation In France.
" Various bad signs began to appear. Immediately after each new issue (money growth) came a marked depreciation; curious it is to note the general reluctance to assign the right reason...New issues only increased the evil; capitalists were all the more reluctant to embark their money on such a sea of doubt... The decline in the purchasing power of paper money was in obedience to the simplest laws in economics...(Supply and Demand.)" from: Fiat Money Inflation In France. Moreover, U.S. dollar gold backing was abolished in 1971. The dollars decoupling from gold and silver ushered in the Great American Bubble. Since that point, paper assets have flourished beyond the dreams of avarice. The resulting inflationary boom diverted hyper-inflated dollars into alternative routes. Firstly, funds flowed into precious metals beginning in 1971, which culminated in 1980 with an incredible peak in gold and silver prices. Next, the stock market expanded from 1980 until 1999, an astounding 20 year period of growth. The final inflation peak culminated in the U.S. real-estate and bond market bubbles and a the current bull market in gold and silver assets. Clearly, the chart above illustrates the degree that Federal Reserve policies affected the 1990's stock market boom. The 1980's yielded similarly impressive stock market results. Expansionary policies distorted the equilibrium within the national supply and demand for money. Consequently, the stock and bond market, real estate and dollar bubbles resulted. A euphoric domestic economy roared forward for two decades, fueled by loose monetary restraints. "...doubling the quantity of money or substitutes for money in a nation simply increases prices, disturbs values, alarms capital, diminishes legitimate enterprise, and so decreases the demand both for products and for labor." from: Fiat Money Inflation In France. Indeed, declining dollar value in 2003-2004, relative to global currencies, temporarily boosted sales and enhanced the competitiveness of many U.S. manufacturers. Yet, dollar erosion leads to hyper-inflation. At first, runaway inflation appears to offer an economic advantage to manufacturers. Price hikes for manufactured goods are implemented without a proportionate increase in wages paid. However, the scenario changes abruptly as domestic consumers curtail purchases for manufactured items due to lower wages earned. For instance, during the 1970's food, gas, clothing and energy prices advanced faster than real wages. During inflationary periods, wages tend to lag far behind price hikes. Higher prices without an incremental rise in personal income places considerable pressure upon fixed income as well as lower to middle income families.
" Still another troublesome fact began now to appear. Though paper money had increased in amount, prosperity had steadily diminished. In spite of all the paper issues, commercial activity grew more and more spasmodic. Enterprise was chilled and business became more and more stagnant. Whenever a great quantity of paper money is suddenly issued we invariably see a rapid increase of trade." Unrestricted monetary expansion has resulted in the worlds greatest Ponzi scheme. Ponzi schemes guarantee exorbitant returns to each subsequent investor. However, the profits used to reward the original participants are merely the entry fees of the final group of unwitting investors. As a Ponzi scheme progresses, it becomes apparent that the last group of investors will receive zero profits as well as lose their initial investment. Similarly, the dollar Ponzi scheme was financed by well meaning investors worldwide. Considered as safe as gold, U.S. bonds were exported to satiate global demand for secure interest payments. However, the surplus U.S. bonds has diluted investor demand. The Federal Reserve must now raise interest rates to combat inflation, which in turn decreases demand for government bonds. Yet, bond values are inversely related with interest rates. In fact, merely the threat of higher rates worries bond investors. Climbing interest rates reduces the value of existing bonds. Thus, in order to decrease exposure to "Ponzi" dollars, investors will lower portfolio exposure to U.S. bond holdings and add a competing asset class: gold and silver related investments. 4) Unregulated, interest rate sensitive derivatives. 1) Renewed dollar deflation: In recent years, most dollars denominated assets have lost considerable value. Although the dollar exhibited considerable strength in 2005, the multi-year downward trend against world currencies is likely to resume. As the dollar continues to wane, U.S. bonds will become less attractive. Eventually, demand for U.S. debt will diminish and market liquidity will evaporate. The deluge of dollars returning to domestic shores will threaten economic stability. 2) Economic weakness/recession: Ironically, following decades of U.S. manufacturing dominance, the nation now consumes more than it produces. In fact, the ravenous appetite for globally manufactured goods encourages demand for U.S. bonds. Yet a significant recession or depression would drastically decrease the spending habits of the American public. The resulting loss of demand for imported goods would decrease foreign demand for new bond issues. If American demand for globally manufactured goods declines,U.S. debt will lose its luster and an economic tailspin will commence. 3) Climbing interest rates: Following decades of decline, interest rates reached the lowest level in forty years. Low rates were fomented, in part, by the loose monetary policies of central banks. As inflation becomes apparent to the general public, the Federal Reserve will be forced to raise interest rates to far higher levels. In fact, the Federal Reserve has increased rates at several consecutive meetings. Bonds eventually lose value in an environment of escalating rates. Thus, U.S. bond sales will force a staggering supply of dollars back into the American economy - leading to hyper-inflation. 4) Rate Sensitive Derivatives: Derivatives are sophisticated financial instruments used to offset market risk, based upon one or more market conditions such as interest rates. Climbing rates negatively impact interest rate sensitive derivatives. Unregulated derivatives mask hidden and oftentimes unlimited risks.
" But if this first expedient shows how naturally a "fiat" money system runs into despotism, the next is no less instructive in showing how easily it becomes repudiation and dishonor." from: Fiat Money Inflation In France. Few analysts claim to grasp the full extent of the danger posed by unregulated derivatives. Yet, an estimated 200 trillion dollars in derivatives threaten the global economy. Although quantifying the precise impact of higher rates on derivatives is difficult, it is certain that the potential for financial chaos is substantial. Warren Buffett, the worlds 2nd richest man and arguably the worlds most successful investor, refers to derivatives as: "Weapons of mass financial destruction." Many of his contemporaries concur that a derivative related quagmire threatens the global financial system. Moreover, the recent bankruptcy of Refco, the nations largest derivatives clearing firm, suggests that a derivatives default looms ahead for the global markets. Within less than 2 weeks of the announcement of Refco's woes, its share price plummeted from near $30 to less than one dollar. When compared with the Enron share price plunge of several months, the rate of Refco's demise is particularly alarming. Should rates suddenly spike higher, the resulting derivatives implosion could trigger an abrupt financial meltdown and culminate in a global financial panic. Indeed, the Long-Term Capital Management (LTCM) debacle of the late 1990's illustrates the significance of the more recent Refco derivatives meltdown. The LTCM hedge fund was managed by the top financial minds of the decade. The staff included 2 Nobel prize winners, renowned for designing the Black-Scholes options pricing model. Although the trading systems were designed by financial wizards, the LTCM models failed miserably with one fateful derivatives trade. In order to mitigate risk to the national economy, the Federal Reserve allocated over $4 billion to relieve debt burdens. Although economic collapse was averted, LTCM never fully recovered and closed its doors within less than three years of the initial meltdown. Furthermore, unregulated derivatives threaten many U.S. municipalities and public companies. The Enron debacle is the most glaring example. LTCM lost over $4.5 billion at the crisis peak. Enron eclipsed LTCM's losses with a staggering share price decline in excess of $70 billion as well as billions in loan defaults. Several unsound energy related derivative swaps lead Enron's share price into an unrecoverable spiral. The result was devastating to individuals, companies as well as pension fund investors. Clearly, unregulated derivatives involve insurmountable risks, oftentimes in excess of the original purchase price. Still, neophytes and uninformed investors alike have been lured by derivatives due to enticing rates of return. Of the staggering $270 trillion global derivatives market, the majority include interest rate exposure (compare the $270 trillion derivative figure with the meager $50 trillion in fiat money in circulation world-wide). Thus an unexpected interest rate surge will create trillions of dollars in market risk. Such derivatives portend tremendous losses for firms, individuals and ultimately the nation as higher rates unfold.
" Out of the speculating and gambling of the inflation period grew luxury, and, out of this, corruption. It grew as naturally as a fungus on a muck heap..." from: Fiat Money Inflation In France.
" Even worse than this was the breaking down of the morals of the country at large... from the gambling, speculative spirit... From this was developed an even more disgraceful result,--the decay of a true sense of national good faith..." from: Fiat Money Inflation In France.
" Says the most brilliant of apologists for French revolutionary statesmanship, "Commerce was dead; betting took its place." from: Fiat Money Inflation In France. Moreover, prosperous economic and political conditions mask the underlying costs associated with speculation and gaming. For instance, the stock market boom from 1980-2000 created incredible economic growth. The ensuing prosperity marginalized the damaging affects of gambling. In fact, one may argue that the satisfaction gained from occasional gambling is worth the invariable losses incurred.
" The French are naturally thrifty; but, with such masses of money and with such uncertainty as to its future value, the ordinary motives for saving and care diminished, And a loose luxury spread throughout the country. A still worse outgrowth was the increase of speculation and gambling..." from: Fiat Money Inflation In France.
" Out of the inflation of prices grew a speculating class; and, in the complete uncertainty as to the future, all business became a game of chance, and all business men, gamblers. In city centers came a quick growth of stock-jobbers and speculators; and these set a debasing fashion in business which spread to the remotest parts of the country. Instead of satisfaction with legitimate profits, came a passion for inordinate gains. Then, too, as values became more and more uncertain, there was no longer any motive for care or economy, but every motive for immediate expenditure and present enjoyment. So came upon the nation the obliteration of thrift. In this mania for yielding to present enjoyment rather than providing for future comfort were the seeds of new growths of wretchedness: luxury, senseless and extravagant, set in: this, too, spread as a fashion. Throughout the ages, numerous investors and financial professionals alike, have fallen prey to currency machinations. No society is fully insulated from widely held investment misconceptions. As long as fiat currencies remain in circulation, the fallacy of unbacked paper money will continue to haunt even the most sophisticated of global economies. More than 150 years have elapsed since the last national hyper-inflation dilemma. Thus, the domestic populace has little to no first hand experience to form an educated opinion concerning the unfolding quandary. Consequently, decades of covertly inflated stock and paper assets have marginalized demand for precious metals. In fact, during the last 25 years, many investors experienced severe declines in gold related investments. Conversely, stocks and bonds were generally ideal investments. Following the quarter century bear market in precious metals, professionals and investors are slow to accept that precious metals are once again the investment du jour. "As a consequence the demand for labor was diminished; laboring men were thrown out of employment, and, under the operation of the simplest law of supply and demand, the price of labor--the daily wages of the laboring class--went down until, at a time when prices of food, clothing and various articles of consumption were enormous, wages were nearly as low as at the time preceding the first issue of irredeemable currency..." from: Fiat Money Inflation In France. Consequently, shifting economic conditions create a precarious situation for investor portfolios. Wealth is a storage medium of financial potential energy. When properly maintained, wealth retains its inherent potency and increases in strength. When ignored and left to the whims of howling market forces, wealth loses potential energy and may be destroyed completely. Retaining capital in difficult periods requires diligent attention to primary financial trends.
" This disappearance of specie (gold and silver coins) was the result of a natural law as simple and as sure in its action as gravitation; the superior currency (gold and silver) had been withdrawn because an inferior currency (paper bills) could be used." from: Fiat Money Inflation In France.
" In speeches, newspapers and pamphlets about this time, we begin to find it declared that, after all, a depreciated currency is a blessing; that gold and silver form an unsatisfactory standard for measuring values." from: Fiat Money Inflation In France. In 2002-2003, gold and silver completed a 22 year bear market and have followed a steady path higher for 3 consecutive years. The fundamentals are firmly in place to sustain the new bull market for several years into the future. Not since 1980 has the technical outlook for gold, silver and gold stocks been more favorable. In fact, all precious metals related charts support the view that a new bull market in gold and silver is underway. 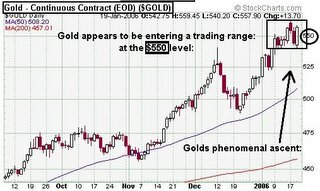 Clearly, the break-out in the gold chart above lead to a meteoric rise in prices as seen in the chart below this text. The current question facing gold investors is whether the short-term and medium-term impulse higher is complete. The chart below indicates that a correction will likely follow the near vertical assent. After the gold market consolidation, prices will likely advance to the $600+ in 2006. Gold stocks recoiled from the upper resistance level then rocketed to a new high point above the upper boundary. The old resistance line has now become a potential support level. The $XAU is poised for much higher levels, following a retest of the break-out point.
" Henceforward, until the end of this history, capital was quietly taken from labor and locked up in all the ways that financial ingenuity could devise. All that saved thousands of laborers in France from starvation was that they were drafted off into the army and sent to be killed on foreign battlefields." All fiat money systems lead to lengthy periods of, social instability, economic distress, and warfare. The resulting inflation reduces living standards to such degree that socio-economic upheaval becomes inevitable. Sadly, the Federal Reserve has chosen to ignore such warnings, that are written upon the tablets of financial history. 18th century France required 40 grueling years of rehabilitation before full economic recovery. Will the U.S. needlessly suffer a similar fate? Although the world is beginning to reject the U.S. dollar, the nation is not doomed to a hyper-inflationary spiral. In fact, a few central banks are halting gold sales and making precious metal purchases. Since this article was first published, the Russian central bank has announced a brilliant and bold purchase of 50 tons of gold. Many Asian central banks will likely follow its lead. Thus, fundamental analysis dictates that silver and gold will no longer remain inexpensive compared with the over-inflated dollar. Technical analysis is forecasting precious metals to exceed current prices within the next 12 months. Gold stocks are near the beginning phase of a new bull market. It is not too late for the Federal Reserve as well as American individuals to protect against the coming inflationary maelstrom and insure financial freedom by converting a portion worthless paper money into gold and silver related investments. Rejection of fiat money is destined to return gold and silver to their rightful position as king and queen among currencies. "At last came the collapse and then a return, by a fearful shock, to a state of things which presented something like certainty of remuneration to capital and labor. Then...(after 40 years!) came the beginning of a new era of prosperity... " from: Fiat Money Inflation In France. Free Weekly Gold Market Analysis: Click Here. Free Copy Of Fiat Money Inflation In France: Click Here. 1. White, Andrew Dickson, LL.D., Ph.D., D.C.L. "Fiat Money Inflation in France (How It Came, What It Brought, and How It Ended)"
This web site and its articles are a non-profit service intended to share diverse concepts and opinions concerning investments. Trading involves a high degree of risk including the possibility of a loss of principal as well as additional costs.This web site should not be viewed as an offer to buy or sell securities of any kind. Additionally, this site and its owners do not recommend any investment system or the purchase or sale of any investment securities. This site is not an investment advisory service, nor is it a registered investment advisor, broker or dealer. The past success of investment concepts is not a guarentee of future performance.analysis is forecasting precious metals to exceed current prices within the next 12 months. Gold stocks are near the beginning phase of a new bull market. It is not too late for the Federal Reserve as well as American individuals to protect against the coming inflationary maelstrom and insure financial freedom by converting a portion worthless paper money into gold and silver related investments. Rejection of fiat money is destined to return gold and silver to their rightful position as king and queen among currencies. This web site and its articles are a non-profit service intended to share diverse concepts and opinions concerning investments. Trading involves a high degree of risk including the possibility of a loss of principal as well as additional costs.This web site should not be viewed as an offer to buy or sell securities of any kind. Additionally, this site and its owners do not recommend any investment system or the purchase or sale of any investment securities. This site is not an investment advisory service, nor is it a registered investment advisor, broker or dealer. The past success of investment concepts is not a guarentee of future performance. Everything that gold has done in recent months confirms my view that gold will escallate to $750 and then to $1,000 and $1,250. All markets move in phases and gold is no exception to that rule. Reaching $548.10 in the time it occurred is for me conclusive proof that the bears and top callers are a gang of fools, fooling themselves and those poor saps that listen to them. How gold performs in the next few weeks will determine if confidence in the present management of the U.S. has totally failed and what timeframe is left to go before that occurs. I know exactly what will determine this, but to make it public would simply act to arm the opposition with the tools of our own unmaking. COT does not have the power to fight every dollar so let’s see if they pick the right dollar level to expend their energy. You will know via our conversations but for now please understand that in the world’s best interest the price of gold should not redo what it has just done because in this case nothing, not even a mountain of gold, would make up for the dislocations inherent in the language of gold that would by that action be communicated. This market period is an opportunity for the 1/3 sellers, who exited those shares with derivative risk, to move into shares without that risk. This is not a time for emotions to govern your decision making. Do not sell into weakness in good gold shares. However, if you are on credit, eliminate that insidious blood sucker from your activities. Even if you eliminate a potential profit by removing margin, it will allow you to take advantage of the full rise which is now magnificent in its potential. Do not demand that the entire party take place in a day. That is the problem with investors that has given us this opportunity. Let the mad people of the over-the-counter derivatives to take their full pleasure in a minute. We are the patient ones who will reap the reward of survival in comfort. Presently the picture has been painted for you in the area outlined by COT’s target on the downside given to you in the cartoon of COT’s Destiny. Now change the price on COT’s destiny to $752.80 without regards for any interim machinations. a terrible price for not having had an energy strategy..."
A 28% drop in the S&P 500. Their findings were so disturbing it's hard to even comprehend . losing more than a quarter of its value - and that's getting off easy. A lot of people (including a lot of naive investors) think that it would take an absolute cataclysm - or a series of them - to propel oil prices into the unaffordable zone. An instant recession all but cripples the U.S. economy. People can't travel because airlines are grounded - or forced into bankruptcy. Some folks lucky enough to hold onto their jobs won't be able to get to work because bus schedules are cut. Grocery store shelves get increasingly bare because it's too costly to ship anything. Car sales plummet as Detroit's Big Three struggle for solvency. There's no money left for travel, entertainment, entrepreneurship or retail buying. The whole U.S. economy stalls on the brink of collapse . Ethnic unrest in Nigeria (12th in world oil production, 11th in reserves) causes a slowdown in that African nation's petroleum industry. The stepped-up aggression from terrorists spurs a mass exodus of skilled Western petroleum industry workers from Saudi Arabia. even minor disruptions can domino into terminal overload. Could Gold Reach $2,500+ In The Next 18 Months?! Could gold blaze back to its all-time high? GOLD bulls predict that the price of the precious metal will return to its 25-year-old all-time high of $850 an ounce in the next few years, despite a heavy sell-off last week. The gold price has gained nearly 16% so far this year and touched a high of $540 on Monday, before plunging to $508 by the end of the week because of heavy selling in Japan. However, many analysts think the pullback will prove temporary and the gold price will rally further next year, possibly even regaining the nominal peak of $850 that it achieved in January 1980, when markets were in the grip of a global inflation scare. However, $850 then was worth about $2,500 in today’s terms. 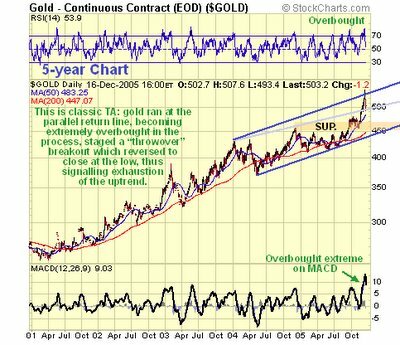 Greg Smith at Fat Prophets, an independent consultant, also thinks a weaker dollar could push gold above $850, but not until 2007. His forecast for next year is $680 to $700 — about a third above current levels. Figures out last week revealed that the American trade gap hit a record high of $68.9 billion (£39 billion) in October, which puts pressure on the dollar because the country imports so much more than it exports. Pierre Lassonde at Newmont Mining, the world’s largest gold producer, has even said the gold price could hit $1,000 in five to seven years. That would make it as expensive as platinum. However, some analysts say the gold market has got ahead of itself. The Japanese have been blamed for the spike. They piled into gold this month as an alternative to the weaker yen, only to be caught out when their currency strengthened against the dollar last week. This led to a rush for the exit and a subsequent drop in the price. But most analysts do not think the pullback is the start of a more sinister downturn. They point to many factors that will prop up the price next year, particularly strong demand, tight supply and political tensions. Demand for gold, primarily for jewellery, is about 12% higher than last year, while supply is flat or in decline, according to Merrick. He also points to strong investment demand from the Middle East and China. “The Middle East, which is awash with cash thanks to the high oil price, is proving to be an enthusiastic buyer of gold, with Dubai becoming a major centre following the recent establishment of a futures market,” he said. Analysts also say that European central banks renewed an agreement to limit gold sales to 500 tonnes a year in 2004 — and there is scope for other banks to buy. Asian central banks typically hold less than 5% of their foreign reserves in gold, compared with up to 70% in Europe, and they could become big buyers if they tire of the US dollar, currently their asset of choice. Argentina bought gold in 2004, while Russia and South Africa have indicated they wish to increase their holdings. 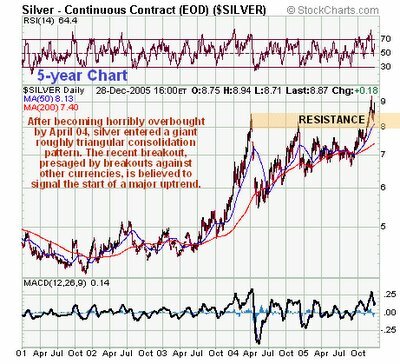 Bullish Long-Term Picture For Silver! - Maund. Gold has displayed classic technical action over the past couple of weeks, with the breakout above $500 being followed by a ramp that took the price to an overbought extreme. In the last update a return trendline was delineated on the 5-year chart, and it was mentioned as a possibility that the price might stage a "throwover" breakout above this trendline, which would signify a reversal, and this is what happened. Last Monday the price rocketed higher in the early trade but closed little changed, back down at the day’s low. This was a classic reversal day and a clear warning for traders to get out. A severe reaction ensued immediately. However, by the end of last week, the “shoe was on the other foot” with the price probing support towards its 50-day moving average and closing well up from the day’s lows, suggesting that, near-term at least, the selling has been overdone and that a rally is likely next week. The question now of course is to determine the significance of last week’s dramatic retreat. One commentator was busy writing gold’s epitaph, calling last week’s action “gold’s final blowoff top”, others believe it has presented a buying opportunity, and expect gold’s advance to resume soon, if not immediately. The truth, however, is probably somewhere in between, for reasons we will now consider. On the 6-month chart we can see the strong advance by gold following the mid-November breakout above the September - November consolidation pattern. This advance eventually resulted in an extremely overbought condition, shown by the RSI and MACD indicators and various other short-term oscillators, and by the huge gap between the price and its moving averages, and between the moving averages themselves, so that the chart was screaming “sell!” when gold made a classic “Reversal Day” candlestick last Monday. On the 5-year chart we can clearly see why gold’s advance halted and abruptly reversed where it did. Gold had risen rapidly to reach the upper return line of the currently operative long-term uptrend channel, so that on its arrival there it was already extremely overbought. It then had the audacity to attempt to break out above this channel, and its failure to do so resulted in an abrupt change of sentiment as traders suddenly raced to lock in big profits. So, what now? Last Monday’s Reversal Day is believed to signal an end to the intermediate uptrend that began not in November, but back in September, when gold broke out of its 10-month long consolidation pattern. This is because the move terminated at the upper return line of the long-term uptrend channel. It is therefore logical to expect a lengthy period of consolidation/reaction before a serious advance can resume. Any reaction is expected to be limited by the strong support that exists at and above the September - November congestion area, with major support from the 10-month trading range coming in at and below $460. The probability of gold breaking decisively above the top channel line, which would lead to a spectacular advance, is rated as highly unlikely over the short to intermediate-term. This kind of action is more the province of penny stocks. Gold’s long-term uptrend remains unbroken and its 200-day moving average continues to rise steadily, so although an intermediate top has been signalled by the action of the past week, a long-term top has not. 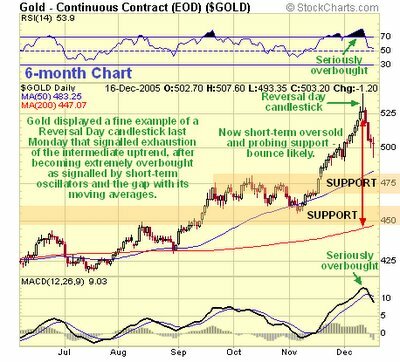 Therefore, any reaction back to support in the vicinity of the long-term trendline and the 200-day moving average will be viewed, as usual, as a buying opportunity, both in gold and gold stocks. On a short-term basis a rally is likely following the plunge last week, as pointed out at the outset, as gold has reacted back into support and Friday’s action was positive. Silver’s action in recent times has quite closely paralleled that of gold and so much of what has been written in the Gold Market update can be taken to apply to silver, except, obviously, prices and support levels. 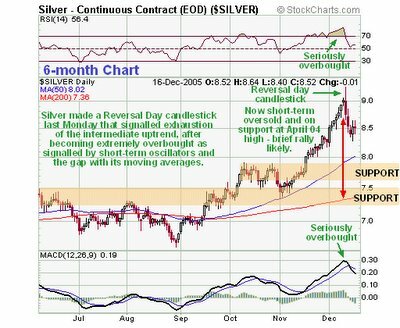 Silver staged a reversal day last Monday after becoming very overbought, similar to that in gold, and then went on to react sharply, although by Wednesday - Thursday it was already stabilizing above support at the April 04 highs in the $8.40 area, which it had earlier succeeded in breaking above by a significant margin. The Reversal Day last Monday is believed to signal an end to the intermediate uptrend that began in September, and if so, a lengthy period of consolidation/reaction is to be expected, mirroring the situation in gold. Although a short-term rally is to be expected next week following last week’s plunge, it is considered unlikely that it will get very far, after which renewed decline it to be expected. It should be noted that if silver drops back into pattern, by breaking back below the April 04 high at about $8.40, and perhaps heads for support in the $8 area, it will not negate the overall bullish pattern. Gold To $850 In One Year!!? Gold and Silver Technical View. - Maund. 1 Paycheck Buys 1 Years Salary In Silver! Gold To $1,000. - Mogg. Platinum Tops $1,000; Gold Is Next. - Reuters.